Our client approached us because they were a few things he didn’t like about his newly purchased villa. First concern was its appearance. His villa looked great from the beginning, but the initial selection of materials and colors did not highlight its design. Therefore, our client asked us to propose solutions on making this villa more interesting. Our initial response was to select a few materials that look great together, but at the same time their physical properties would be suitable for the area. We selected materials that would not fade out due to strong sunlight and they would sustain their colour and texture with little or no maintenance at all. 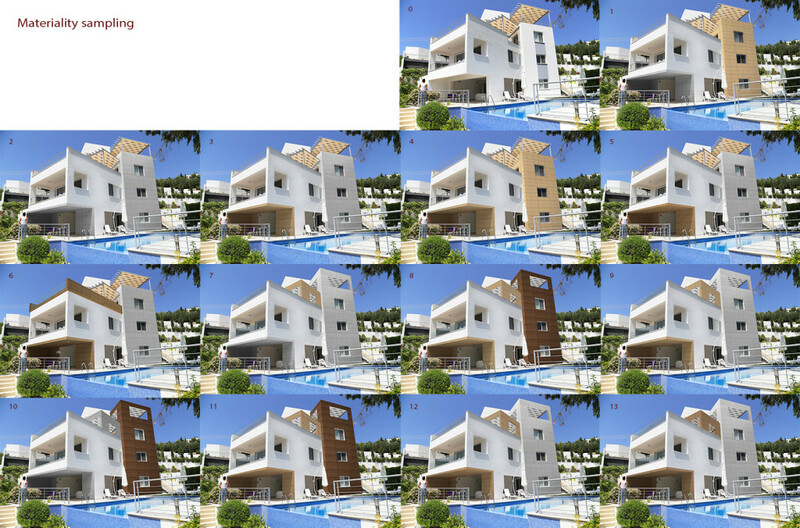 The materials of preference is FCP (Fiber Cement Panels), HPL (High Pressure Laminate) and Iroco wood. Soon, after we started the experimentation with these three materials, we ended up on creating thirteen different proposals comprised by HPL, FCB and Iroco with different tints and shapes of the additional volumes. When our client chose the final one, we made a few more 3D visualizations to help him comprehend the overall look of his property. Also,we have prepared detailed construction/assembly drawings instructing the installers of the size and shape of each individual panel. Since the villa was initially designed to be on four storeys, we deemed necessary to install an elevator to make it more accessible. We did not want to use any extra built allowance to build an extension for a conventional elevator system, so we had rather chosen to be more creative and look for alternative solutions. Soon, we managed to find a unique type of elevator with a total external cylinder diameter of 933mm which allowed us to pass it through the middle of the staircase. This elevator has a vacuum system which replaces all the mechanical parts of a conventional one and thus its small size. Also, we are glad to say that we are the first who have installed such a system in Cyprus. Here, you can watch a video of our happy client launching for his space odyssey for the first time!